Nuclear magnetic resonance (NMR) is an analytical tool used by chemists and physicists to study the structure and dynamics of molecules. In recent years, no other technique has gained such significance as NMR spectroscopy. It is used in all branches of science in which precise structural determination is required and in which the nature of interactions and reactions in solution is being studied. Annual Reports on NMR Spectroscopy has established itself as a premier means for the specialist and non-specialist alike to become familiar with new techniques and applications of NMR spectroscopy. This is an invaluable resource for organic, inorganic, analytical and physical chemists, biochemists, structural biologists, physicists, and all those studying and using NMR spectroscopy. 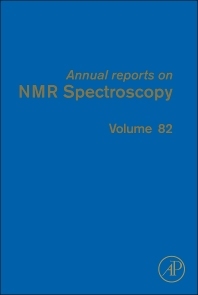 Volume 82 of Annual Reports on NMR Spectroscopy focuses on the analytical tools used by chemists and physicists. Taken together with other volumes of this series, it provides an excellent account of progress in NMR and its many applications for anyone using NMR.